I don’t remember the first time I tried anything with truffle, but I do remember when I fell in love with it. We were on a road trip in Tuscany when the night caught us in Radicofani – a small town (or rather a village) in equal distance from Perugia, Grosseto, Siena and Viterbo. I didn’t expect much from a little family restaurant, but it was the best pasta I ever tried. And it was with truffle oil. Since then I am obsessed with everything truffle infused and I always have a bottle of truffle oil, which I sprinkle on anything – from avocado toast to porridge. Today I’d like to share my favorite pasta recipe, very simple but delicious. There is plenty of choice for truffle oil. I would recommend getting both black and white truffle oil if you have never tried it before. There is a slight difference in taste and flavor, so you can make your decision and choose your favorite. For instance, this TruffleHunter Truffle Oil Selection comes in a gift set with three truffle oil kinds – black, white and English (the latter is a less intense version than the other two). It is very strong in flavor, so try adding little by little, so that the taste of truffle does not suppress the other ingredients. 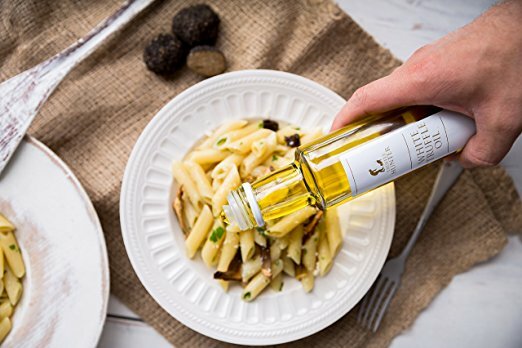 However, if you are a truffle-pro and want something even more intense, you should consider the Chef’s Truffle Oil Set (Super Concentrated), also by TruffleHunter, – you will just need a few drops to get a rich aroma and taste. Use primarily as a finishing oil to dress dishes just before serving. And if you want a lighter version, with a less distinctive “oil taste”, you can give a try to my personal favorite – grape seed truffle oil, for example, Elle Esse – Italian White Truffle Grapeseed Oil. Clean the mushrooms (do not use water since mushrooms are absorbing it quite well, which can deteriorate the taste of the dish) and cut into pieces you like. I prefer to cut them so that the shape reminds the real mushroom.